You’ve probably heard doctors on TV shows describing their patients’ ailments and referring to “numerous contusions.” Contusions can be very serious, but the vast majority of the time they are simply good, old-fashioned bruises caused by relatively mild injuries. Bruises, known as contusions in the medical field, are characterized by skin discoloration, pain and swelling. They develop from bleeding under the skin that occurs when blood vessels are broken. Usually starting as pink or red marks, they can become blue or deep purple within hours. The color tends to be more intense when the broken capillaries are closer to the surface. 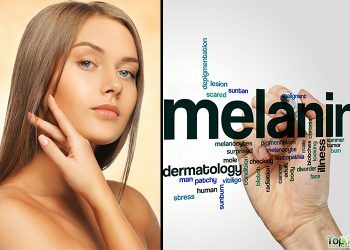 You may be more prone to bruising, even from slight injuries, if you have thinning skin, lack of nutrients like vitamin C and K, obesity, anemia, leukemia, bleeding disorders, or use certain medications. Depending on the severity, bruises can last for days or months. But, you can get symptom relief and speed up the healing process using easy and effective home remedies. Here are the top 10 home remedies for bruises. Ice packs are highly beneficial for reducing pain and swelling. Ice helps constrict the blood vessels, thereby preventing further seepage of blood into the skin and tissues. Wrap ice in small cloth or towel and hold it over the affected area for up to 15 minutes. Do this immediately after getting the bruise. Repeat every few hours for the first 24 hours. If ice is not available, you can use a bag of frozen vegetables instead. 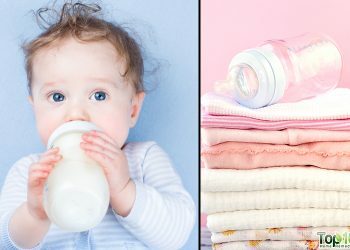 For those who find the extreme cold from ice uncomfortable, particularly children, you can use a cloth soaked in cold water. To enhance the soothing effect, add a few drops of lavender oil to the water. Note: Do not apply ice directly on the skin as it may give you frostbite. You can also use a cold tea compress to soothe the affected area and reduce swelling. Put one teaspoon each of dried chamomile flowers and lavender flowers in a cup of hot water. Cover it and let it steep for about 15 minutes. Strain the solution and refrigerate it. 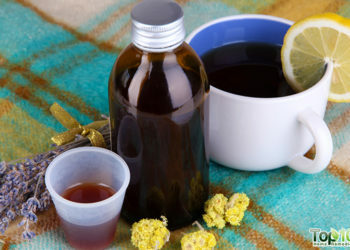 Dip a cloth in the cold herbal tea and use it as a cold compress. Repeat this a few times a day for the first 24 hours. The herb arnica can help decrease inflammation, reduce pain, and increase circulation to the area around the bruise. Gently rub arnica gel or tincture (when using the tincture, add a small amount of water) on the affected area a few times a day. 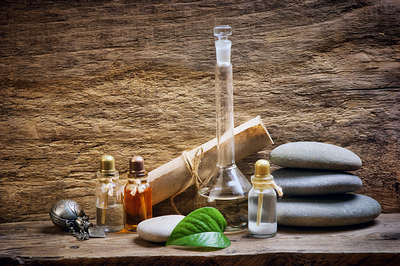 Alternatively, combine one tablespoon each of arnica tincture, St. John’s wort, witch hazel bark, and chamomile flowers. Mix in four drops of lavender oil and two tablespoons of cold water. Soak a washcloth in the solution and place it on the affected area. Leave it on for about 15 minutes. Do this once or twice a day in the first couple of days. Note: Do not apply arnica on broken skin. 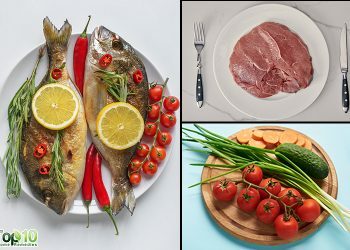 Vitamin K helps decrease bruising as it regulates blood clotting. Gently rub vitamin K cream on the affected area twice daily. Eat more foods rich in vitamin K, such as alfalfa, spinach, broccoli, lettuce, kale, and other green leafy vegetables. 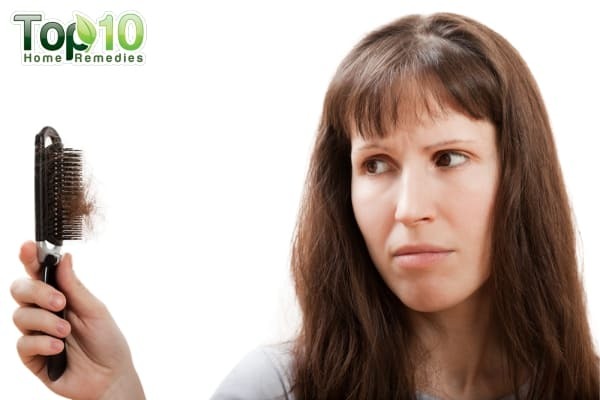 You can also take vitamin K or alfalfa tablets, after consulting with your doctor. Note: Do not take vitamin K if you are taking blood-thinning medication or if you have a history of increased risk of blood clotting. Bromelain is a protein-digesting enzyme present in pineapples. It has strong anti-inflammatory properties and studies have found that it helps heal bruises quickly. It also has been found useful for treating bone bruises. Take a bromelain supplement (250 to 400 mg, three times a day) until the bruise clears. You can also eat fresh pineapple, but this alone does not usually provide a sufficient amount of bromelain to treat bruises. Comfrey is a centuries-old remedy for wounds, sprains, and bruises. You can use comfrey tea as a compress, initially as a cold compress for one or two days and then as a warm compress. To prepare comfrey tea for this purpose, steep one tablespoon of dried comfrey herb in one and one-quarter cups of hot water for 15 minutes. After the first couple of days or after the initial swelling is gone, a warm compress can be useful in treating a bruise. It helps dilate the blood vessels and improves circulation. 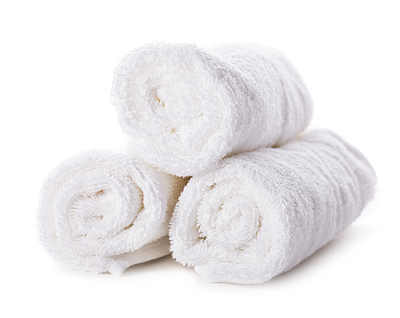 Simply soak a washcloth in warm water and apply it on the affected area. Alternatively, you can use a heating pad. Do not apply heat during the first couple of days after the bruise appears; it can cause increased bleeding under the skin. St. John’s wort has anti-inflammatory properties that can help heal a bruise. It also works as an analgesic for pain relief. Apply St. John’s wort oil on the bruise several times a day for a few days. 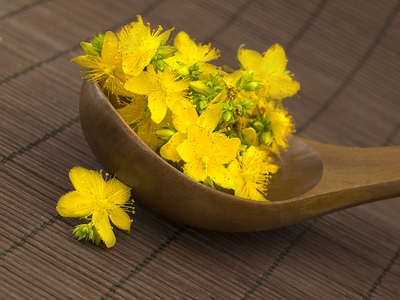 Alternatively, steep two tablespoons of dried St. John’s wort in a cup of hot water for 10 to 20 minutes. Drink it once daily till your bruise heals. Being a natural anti-inflammatory, apple cider vinegar can help heal bruises. Use it for a few days until you see improvement. 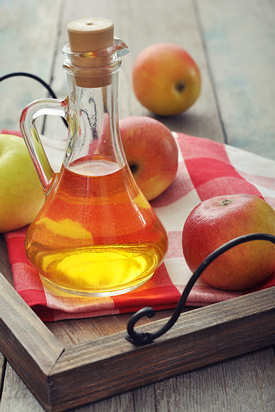 Soak a cloth or paper towel in apple cider vinegar mixed with a little water and place it on the affected area as a compress for about 10 minutes. You can also dip a piece of raw or roasted onion, which helps reduce pain and inflammation, in apple cider vinegar and apply it on the affected area. Leave it on for 15 to 20 minutes. Note: Do not apply these remedies on broken skin. After a couple of days, massaging the bruised area with a blend of essential oils will increase circulation and help disperse the pooled blood. Mix five drops of calendula oil, two drops of fennel oil, and one drop of cypress oil in four teaspoons (10 ml) of grapeseed oil. Gently rub this oil blend on the affected area. Besides these remedies, keep the bruised area elevated to prevent blood from pooling in the affected tissue. Plus, do not overwork the muscles in the bruised area. If bruising occurs without any injury or apparent reason, or if the area around the bruise shows signs of infection, consult your doctor. 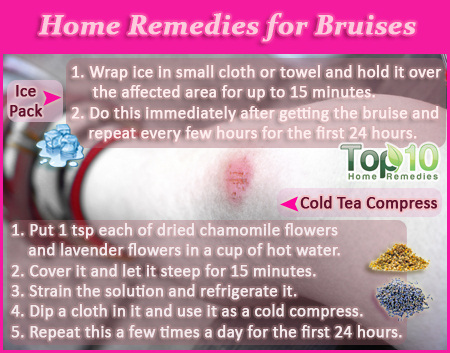 Thank you for the tips on home remedies for bruises. I increased my consumption of Kale and cabbage after this tip I tried. After applying a covered ice pack to the bruise I used a rubber spatula to beat a cabbage and kale leaf until it released the juice from within the leaf. Next while the leafs were cool I laid them over the bruised area, wrapped it securely for 1 hour. finally I removed the wrap and discovered that the bruise was signifantly reduced and had begun to turn slightly yellow. What a relief.